Meet Key Journeys: It’s a brand new SessionCam feature designed to take the pain away. Your most important routes to conversion are automatically revealed so there’s no need for you to waste time fiddling with funnels. 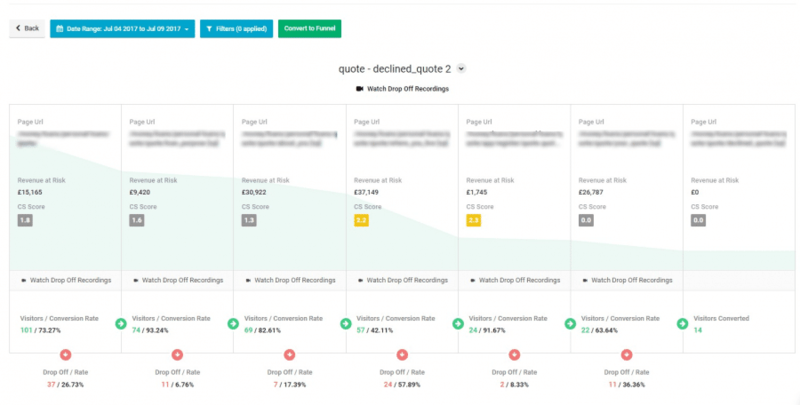 Key Journeys detects patterns in your website traffic, intelligently suggesting and prioritizing them against your existing routes to conversion. It uses machine learning techniques to understand the relationship between journey flow and page type, analyzing the range of sources from which website visitors arrive and exit. You’re no longer locked into funnels. Instead, Key Journeys looks at the paths through your website as a graph, revealing the stages that are truly important in turning visitors into customers. You don’t have to scour through the data either, Key Journeys considers the complex mix of behaviors that lead to conversions for you. Where you once had to focus on whether your existing funnels were working, Key Journeys reveals previously hidden routes to conversion. You don’t have to spend hours analyzing the data. Every day, SessionCam surfaces the paths taken by your visitors that lead to the best conversion rates. Your Key Journeys are sorted according to Revenue At Risk, with the most valuable shown first. You don’t need to know URLs or the sequence they appear in. Each step in the process is visualized for you so you can see the exact routes visitors are following. Key Journeys is part of a whole family of intelligent features in SessionCam. It feeds into our forthcoming Recommendations engine, which will automatically determine your most costly conversion issues, and gives you a jumping off point to dive deeper into your data using Form Analytics. This is a really different approach to understanding your website’s routes to conversion. You can live your traffic and grow to love how dynamic your customer journeys really are, instead of being limited and frustrated by your funnels. Move away from those fragile funnels and let Key Journeys take the pain away. Find a plan to suit your business here.